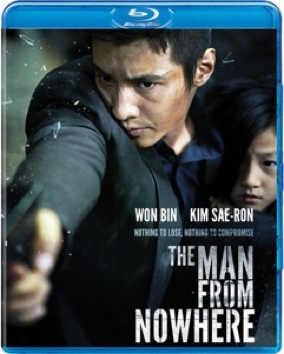 Blu-ray Review: "The Man from Nowhere"
A megahit from Korea slams onto Blu-ray. Expect a fair amount of destruction, a lot of slashed throats, and some flying body parts. “Nothing to lose, nothing to compromise” says the tagline. Korea’s biggest hit movie last year, The Man from Nowhere neither lost nor compromised, and won seven of the country’s film awards. So how does our man do in America? The Story: Pretty well, I’d say. This is far from a fuddy-duddy, committee-approved “foreign movie”; imagine Lethal Weapon winning seven Oscars and strap yourself in. That said The Man from Nowhere is definitely from somewhere, as it cribs unabashedly from several sources. There’s America: Tae-sik (Won Bin), a lowly pawnshop owner, barely puts up with the antics of his neighbor So-Mi (Kim Sae-ron), a friendless little girl whose junkie mother is mixed up with drug smugglers (recall Gloria, where the gun moll played by Gena Rowlands or if you must Sharon Stone was stuck playing nursemaid to a kid neighbor). There’s Europe, or European-ish: When So-Mi and her mom are abducted by a particularly ruthless gang, one that sells smack and illegally harvested organs, Tae-sik wipes the bedraggled bangs from his eyes and takes up arms once more–what the bad guys don’t know is that he’s a highly trained military operative who has gone underground to bury traumatic memories (recall Jean Reno in The Professional). There’s Hong Kong: His skill with a blade and a gun fillets and punches more than a few holes in the underworld, which would have made John Woo proud in his “heroic bloodshed” phase (recall Chow Yun-Fat in The Killer). But even Woo, no slouch with the squibs, would have blanched at the very Korean extremes Tae-sik goes to–over-the-top revenge sagas are something its cinema does well (Park Chanwook’s “vengeance” trilogy, including Oldboy, blew the roofs off arthouses a while back, and a new one, I Saw the Devil, is currently endurance-testing US audiences) and things get very messy. Audio/Video: You don’t miss a trick in this excellent 1080p transfer (2.35: 1 aspect ratio), which has the slick look and, ahem, razor-sharp visuals of its Hollywood counterparts. (Both the lighting and cinematography walked away with honors.) Skip the lackluster English dubbing version and enjoy the film with subtitles in the punchy Korean DTS-HD Master Audio 5.1 mix; the squishy, gargly sound throats make when they’re being cut is universal. Special Features: Besides the trailer and a selection of highlights there’s a 17-minute making of (subtitled) that focuses on the film’s stunts and award-winning visual effects. Writer-director Lee Jeong-Beom is proud to have added some new-to-Korea elements to the mix and it was here that I finally recognized Won from the film Mother, where he gives a strikingly different performance. Bottom Line: Thanks to the chemistry between its two award-winning leads rest assured that The Man from Nowhere has a heart–and some hands, limbs, and eyeballs to go with it.